London’s Cartwright Gardens is a piece of classic Georgian streetscape, consisting of an elegant semi-circle of dark-brick townhouses. It lies in between the core of London city centre and the two railway stations of King’s Cross and Euston, which did not yet exist at the time of construction. The semi-circular terrace is the perfect shape for these buildings because it allows vistas only of the fronts of the buildings. The geometry of the semi-circle means that looking out the back of any of these buildings makes it impossible to see the rear facades of the neighbouring buildings. This is entirely in keeping with the clean and proportioned aesthetic of the fronts, which are possible only at the expense of the jumbled and irregular rears. Thus, the townhouses of Cartwright Gardens were designed so that the only thing that could be seen from the rear would be the gardens of the houses themselves, providing a buffer between the terrace and whatever the next building would have been around 1807. 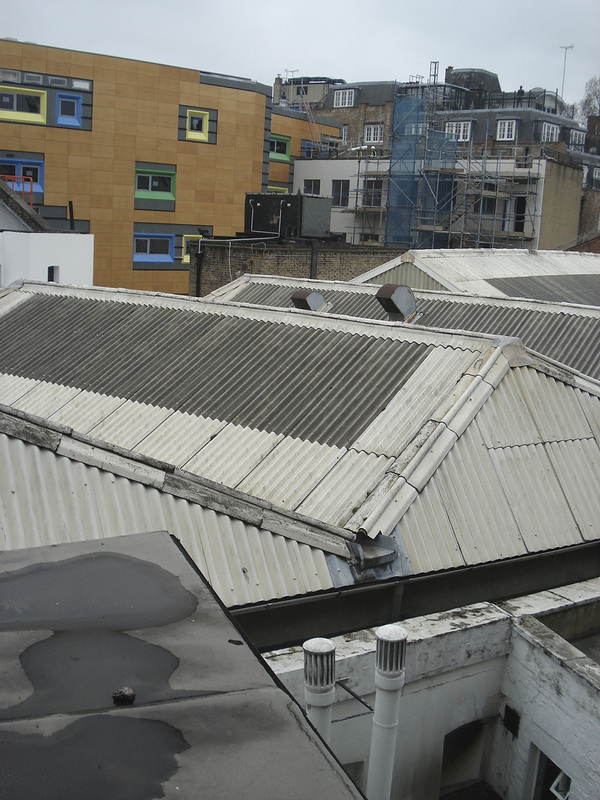 This is the view from the rear of the Harlingford Hotel, on the south side of Cartwright Gardens. Whatever green space there was visible from here has been eaten up in the intervening years, and now the townhouses have no space out the back other than the closed-in courtyards which act as light- and air-wells. The pressure of space and the temptation of high land prices have taken their toll, and now the genteel terrace contemplates an array of warehouse roofs. The overall effect is that distinctively London look of eras upon eras, spaces upon spaces, blocks upon blocks, where the commercial imperative above all has created a jumble that ranges from captivating to distressing, depending on your mood and your pay level. There has been little to invite hotel guests to glance out the window of the return stairs between the third and fourth floors, from where this picture was taken. Until 2009/10, that is, when the colourful rear facade opposite suddenly appeared. What the children’s colourbook colour-scheme of the new building attempts to distract us from is the fact that the new structure has filled the only unoccupied gap on the entire block. The new building appears in this satellite image as a grey rhomboid, backing on to the beige-roofed buildings on the north side of Tavistock Place. The warehouse roofs of the first picture shine white in the sunshine in the satellite image. The view from the window at the back of the Harlingford used to include the rear of Tavistock Place, but this is a fact I can assert not from memory but only from deduction. I have stayed in that hotel many times, and looked out that window many times, but I can no longer remember what the view used to be. Now that this new building has appeared, a gap in my memory has opened. Nobody knows the value of an empty site more than a building developer, except perhaps the people who spend the rest of their days gazing out at the object that has taken its place.